Daughter of Hugleikur frá Galtanesi (8.19) and Mugga frá Fremra-Hálsi. Skrugga frá Skorrastað 4 (7.92) is a secound prize, good looking black mare with first prize for Conformation, 8.01. Skrugga has very good movements and great gaits. She has incredible basic gaits, walk trot and canter, she also has very good tölt and is improving her balance on it every day. She has 9 for canter, 8.5 for tölt, gallop, spirit, general impression, walk and for slow tölt, and 8 for trot. Skrugga has quite a bit of training on her by now and knows a lot of exercises that are helpful in training. She is very a promising four gait competition horse and would be a great project for an experienced trainer to take to the highest level. Her highest score in B-Class is 8.20. 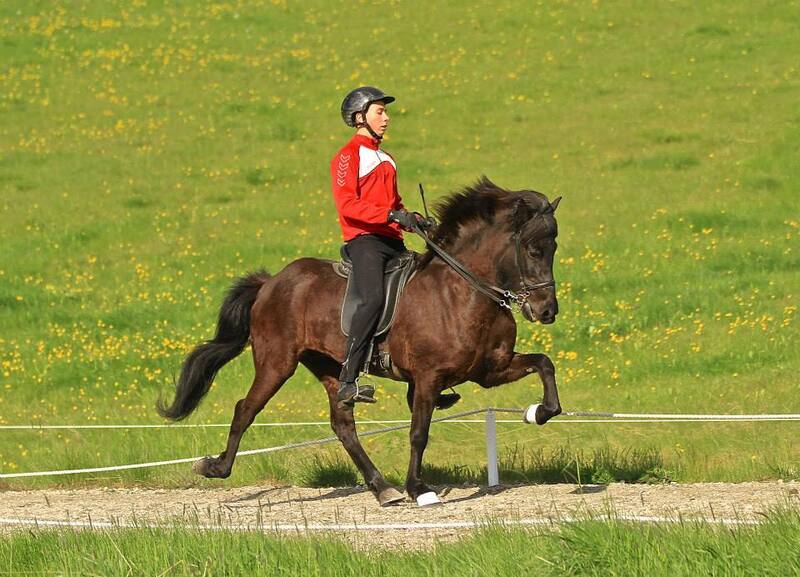 ​She is the daughter of the four gaited champion, Hugleikur frá Galtanesi (8.19) and Mugga frá Fremra-Hálsi. Skrugga's father, Hugleikur frá Galtanesi (8.19), son of Andvari frá Ey, is a four gaited stallion that has 8.28 for Conformation and 8.13 fro Ridebilities; 8.5 for tölt, 9 for trot, 9 for gallop, 8.5 for spirit, 9 for general impression and 9 for walk. Hugleikur has also 8 for slow tölt and 9.5 for canter. Hugleikur won the Four Gait in the Meistaradeild 2014 with 8.27 in Finals.